This speaker set lets you fall asleep to your long-distance loved one's heartbeat in real time. Drift off to Dreamland comforted by the sound of someone special's heartbeat, even if they're far away. 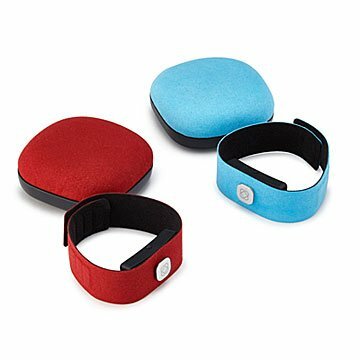 The next best thing to having them next to you, this set of speakers and wristbands lets you connect with your loved one across long distances. Each of you wears a rechargeable wristband to bed and tucks a speaker (connected to your phone) under your pillow. As the bands pick up your pulses, the sounds of your heartbeats are transmitted in real time—across the internet via iOS or Android app—to the opposite speakers. Sweet dreams all through the night aren't guaranteed, but at least falling asleep apart will be a little sweeter. Designed by Joanna Montgomery in Scotland. Made in China. Fueled by a frustration around the way we use screen-based devices to communicate, Joanna Montgomery wanted to create a more “human” way to feel connected to someone you love when you can't be with them. She first developed her heartbeat speakers as a small project, but when it went viral, she knew there was an opportunity to use them to help people across the world feel close to one another. A Scottish designer now living in London, Joanna spent five years working to turn her project into a commercial product. From the initial designs to visiting the production floor to do her own quality control, she’s been involved in every step of the process. Now that what she calls her “labor of love, for love” is a real product, Joanna hopes her creation can bring a little more intimacy to those who have to be far away from their loved ones. iPhone users (7 onwards): headphone adapter will be needed to attach to your speaker. Took a while to get it set up and working properly but once we got the hang of it, we love it! It makes me feel really close to my boyfriend when we can't be with each other. The sound could be louder but it's still great.